10" LCD writing tablet with one-key clear and lock function. Environmentally friendly, with long battery life. It can be recyclable student exercise book/digital drawing tablet/memo & etc. Comes with a pressure pen. 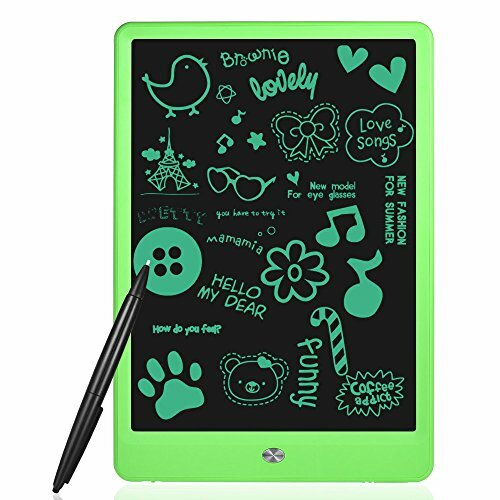 10" LCD screen offer big drawing area and display eye-protective turquoise handwriting. Comes with a pen provide no delay fluent writing experience, the line can be thin and thick. All clear function, slightly click the metal key to erase the screen. Screen lock function, the metal key will not work when the screen is lock, your drawing won't be cleared unexpectedly. Environmentally friendly, save thousands of papers and trees! Can be recyclable student exercise book/digital drawing tablet/memo & etc. ABS hard frame with round board, enhance durability and sense of comfort; Lightweight and portable. You can use a scanning smartphone APP to scan your drawing and share it with friends. Item Size: 24.9 * 17.4 * 0.7cm / 9.8 * 6.9 * 0.3"
Package Size: 29.5 * 19.5 * 1.4cm / 11.6 * 7.7 * 0.6"
Color aberration may exist due to photographic conditions such as lighting. 10" LCD screen offer big drawing area and display eye-protective turquoise handwriting.Comes with a pen provide no delay fluent writing experience, the line can be thin and thick. All clear function, slightly click the metal key to erase the screen. Screen lock function, the metal key will not work when the screen is lock, your drawing won't be cleared unexpectedly. Low power consumption; Powered by 1pcs button battery, battery life 6 ~ 12 months; easy to replace. (Included. )ABS hard frame with round board, enhance durability and sense of comfort; Lightweight and portable.